Guests visiting Four Seasons Resort Rancho Encantado Santa Fe can get inspired for their New Mexico adventure at the new Adventure Center. Interact with the team from Adventure Partners, browse the growing library of books about New Mexico culture, and arrange a customized tour to experience a variety of unique excursions. 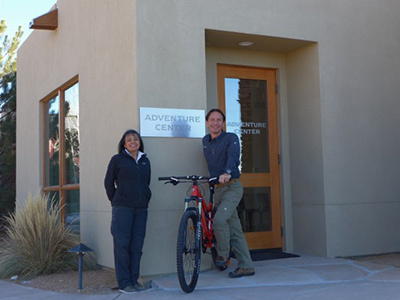 The new Adventure Center features a developing collection of books, comfortable leather chairs to linger and relax, and a variety of equipment on display including mountain bikes, trekking poles and snowshoes. Guides will be on hand to answer questions, and provide firsthand insight into tours. Working in tandem with the Adventure Partners staff is the new Experience Assistant at the property. Situated in the lobby, the Experience Assistant will help create a seamless booking process for guests to plan their adventures, as well as their entire Santa Fe itinerary. 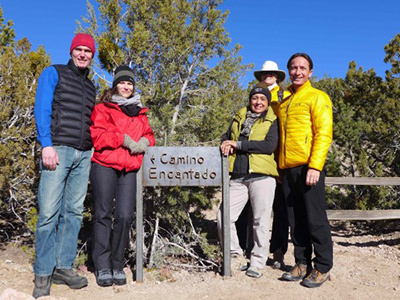 Adventure Partners leads a daily, complimentary guided hike –Camino Encantado – open to all guests on property. Hike participants gather in the lobby to walk a short distance to the 1.2-mile (2 kilometre) Camino Encantado Trail, a historic ridge trail on the north side of the property. Guests enjoy views of the surrounding Sangre de Cristo and Jemez Mountains, and along the way, stop to learn more about the history, flora and fauna of Rancho Encantado. The departure time of the hike varies, depending on the season. Plan ahead with the Santa Fe Adventure Package, offering the choice of three unique tour options, each three hours in length, or upgrade to a half- or full-day excursion to destinations such as nearby Taos or Abiquiu. Reserve a suite and enjoy additional incentives, including daily breakfast for two and a one-time USD 150.00 Spa credit. Tour options include: Rio en Medio hiking tour to the waterfall; a Tsankawi archeological tour; or a three-hour Santa Fe city walking tour.